JERSEY CITY, NJ – SEPT. 15, 2016 – They can handle the challenge of being the first to respond to emergencies, but can they handle the heat in the kitchen? Which of Jersey City’s first responders cooks the juiciest pork, the most flavorful chicken, and the most decadent mac n cheese? Those questions will be answered this Sunday, Sept. 18th, at the First Annual Jersey City First Responders Charity Cook-Off. The event will be held at The Beacon, 20 Beacon Way in Jersey City, from 11 a.m. to 4 p.m. Jersey City police officers, firefighters and emergency medical technicians will be on hand, and many of them will be cooking up their favorite dishes hoping to win the favor of the crowd. Those who purchase tickets will be able to vote for their favorite and a special panel of celebrity judges will also help choose winners in various categories. The celebrity panel includes New Jersey Devils legend Ken Daneyko, “Cake Boss” Buddy Valastro, and “Goodfellas/A Bronx Tale” actor Joey D’Onofrio, among others. In addition to the food tasting, the festivities will include a variety of food trucks, children’s games and activities, door prizes, music and more – all set against the spectacular backdrop of the Manhattan skyline. Confirmed food truck participants include Jerk and Grind, Me Casa, Thai Elephant, Jeannie Cupcakes and ModCup. Tickets are $20 for adults and $10 for children ages 12 and under. Proceeds will benefit the Jersey City Firefighters Distress Fund, the Police Unity Tour and the Code Green Campaign. Tickets are available by visiting http://bit.ly/JCCharityCookOff. All advance tickets purchased through the Eventbrite link by Saturday at 11:59 p.m. will be automatically entered into a door prize drawing for a Citi Bike one-year membership. Tickets will also be sold on-site the day of the event. Free on-site parking is available at The Beacon during the event. A free shuttle to the Beacon will also run every 30 minutes between 10:30 a.m. and 3:00 p.m., picking up from the Exchange Place and Grove Street PATH stations. An advance ticket purchase is required to board the shuttle. 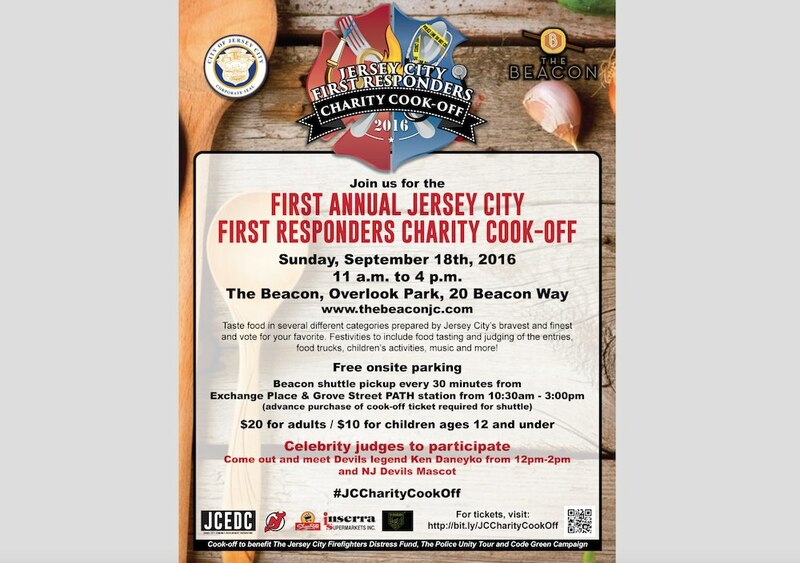 More information on the Jersey City First Responders Charity Cook-Off is available on the ticket purchasing page or by emailing jcfdjcpdcookoff@gmail.com.